Here is the screen shot of Spyhunter3. Hopefully the attachment works. Scan with Spyhunter again and tick "Check All Parasites" and delete those. Rescan again. Post another screen shot (Use Paint Start > All Programs > Accessories > Paint copy and paste the image and save it as a jpg file) try scroll across so that I can see the Objuect Name and the full location in the screen shot. I don't have the full version of spyhunter only the scan portion. Is there anyway to delete these registry files or am I going to have to buy spyhunter? Its probably having you on, trying to convice you to buying something you dont need. I wouldn't buy it. There is nothing in your logs, we'll run some good scans to get rid of anything. Here are the 2 logs. Combofix log. "2008-03-18 09:00:00 C:\WINDOWS\Tasks\AdwareAlert Scheduled Scan.job"
"2008-03-17 00:37:59 C:\WINDOWS\Tasks\FRU Task #Hewlett-Packard#hp psc 2100 series#1205714223.job"
O4 - HKLM\..\Run: [DVDTray] "D:\Program Files\HP DVD\Umbrella\DVDTray.exe"
O4 - HKLM\..\Run: [iTunesHelper] "G:\Program Files\iTunes\iTunesHelper.exe"
O4 - HKCU\..\Run: [SmileboxTray] "C:\Documents and Settings\Josh\Application Data\Smilebox\SmileboxTray.exe"
Could you please scan with Spy Hunter again and save a screenshot so that I can see the Location of the entries that it finds. "2008-03-19 09:00:00 C:\WINDOWS\Tasks\AdwareAlert Scheduled Scan.job"
We need to backup the registry before we continue. Registry edits can be potentially dangerous; we can revert to the backup if needed. Go to Start » Run » type: regedit » OK.
On the leftside, click to highlight My Computer at the top. Make sure in that window there is a tick next to "All" under Export Branch. Leave the "Save As Type" as "Registration Files". Click save and then go to File » Exit. Save text below as fixme.reg in Notepad. Under Save as type, select All Files and save it on your Desktop. The above Registry file was written specifically for this infection on this person's computer. It is NOT to be used on another computer, as it may cause damage that could result in a format! You will receive a prompt similar to: Do you wish to merge the information into the registry?. Answer Yes and wait for a message to appear similar to Merged Successfully. Edited by sarahw, 21 March 2008 - 01:16 AM. Do you need me to post the logs again? Sorry about the delay, I was busy over Easter. 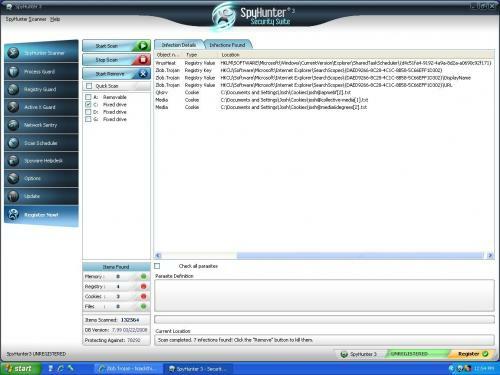 Scan with SpyHunter again and post a fresh Hijack This log. Don't worry about the delay, I am just glad you are helping me. Save text below as fixme.bat in Notepad. Under Save as type, select All Files and save it on your Desktop. Notepad should open with text on your screen, post or upload that into a reply. when I double click on the fixme.bat a screen pops up for a second, not long enough for me to copy and paste it. I can't even read the whole thing because it flashes to quick.